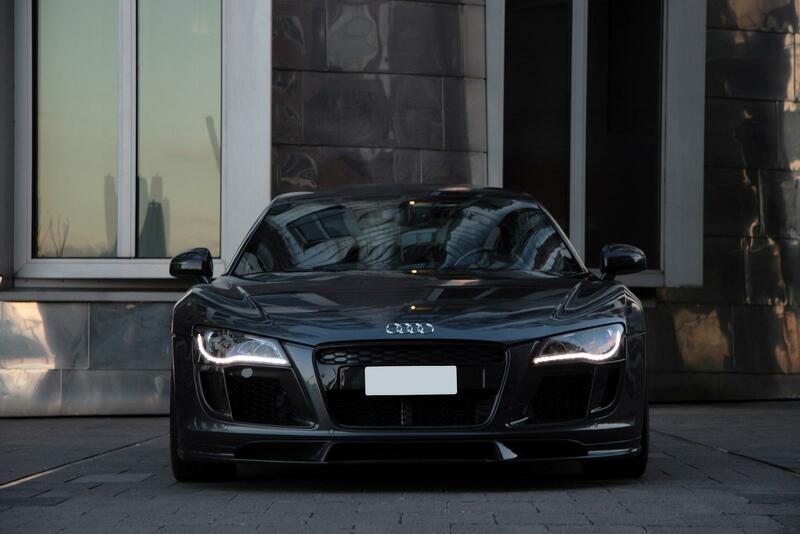 Anderson Germany has just revealed their latest Audi R8 tuning program. 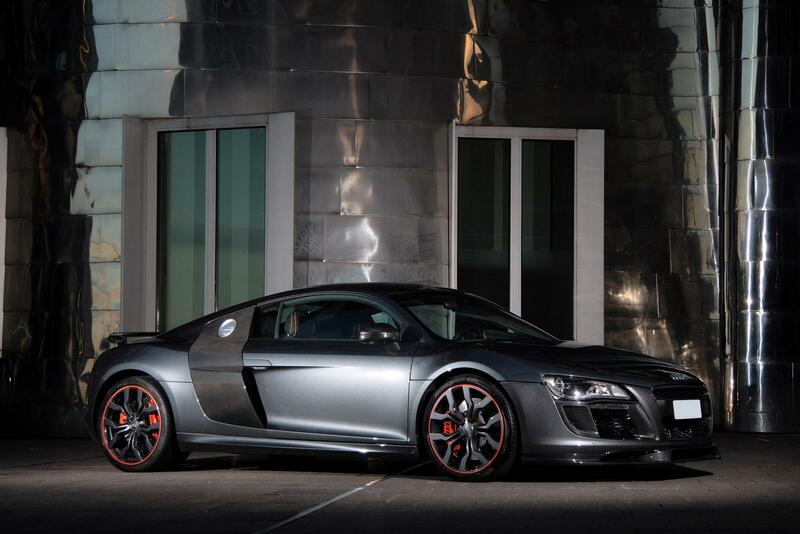 Known as the Audi R8 V10 Racing Edition; highlights include a bump in horsepower to 585hp, increased top speed and killer looks thanks to plenty of carbon fiber and 19" carbon-coated wheels. Details, photo gallery and video after the jump. Under the hood, the Anderson Audi R8 V10 Racing Edition features an upgraded engine management system, lightweight sport exhaust, racing cats and a performance air filter. 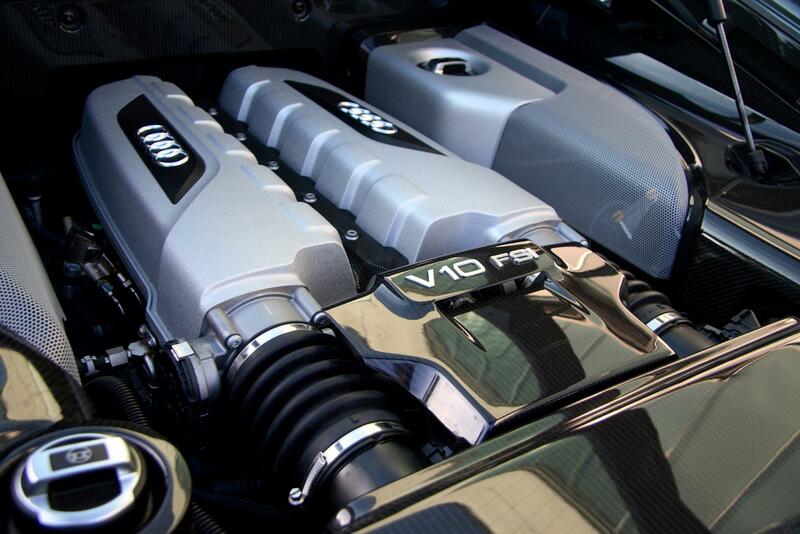 These go-fast mods are enough to add 65hp to the R8's 5.2 FSI V10 for a total of 585 horses. Though Anderson does not provide any acceleration figures, they do note the car's top speed has been raised by 7.5 mph to roughly 204 mph. Outside, enhancements include a full Anderson Germany aerodynamic kit featuring carbon fiber front apron, rear spoiler, diffuser, rear window bordering and mirrors. Carbon fiber details are also abundant inside the car. The cockpit features carbon fiber door trims, radio frame, ashtray, gear stick frame, hand brake knob and steering wheel. Finally, matte-carbon dyed leather with orange "rhombus-shaped" seams rounds out the package. Before you jump to photo gallery, be sure to check out this short (but awesome) video of the Anderson R8 V10 caught in the wild. Lovin' that growl! The brand of ANDERSON GERMANY is known worldwide, if it matters the tuning of sports cars or luxury sedans. With its new tuning program for Audi R8 the Dusseldorf enterprise offers some sportive accessories and an exciting car body design. According to the powerful appearance of the R8, ANDERSON GERMANY use serial light alloy rims dimensioned 8.5x19 and 11x19 with tires 235-3519 / 295-30 R19. 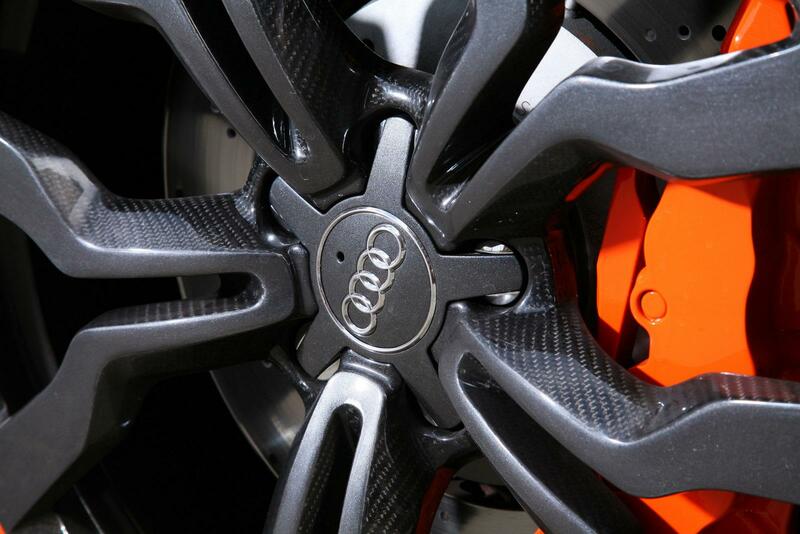 The special particularity of these one part wheels is the carbon coating of the lateral surfaces and the bordering in racing orange. Nevertheless, the basic principle of ANDERSON GERMANY is its producer quality right down to the minutest detail. 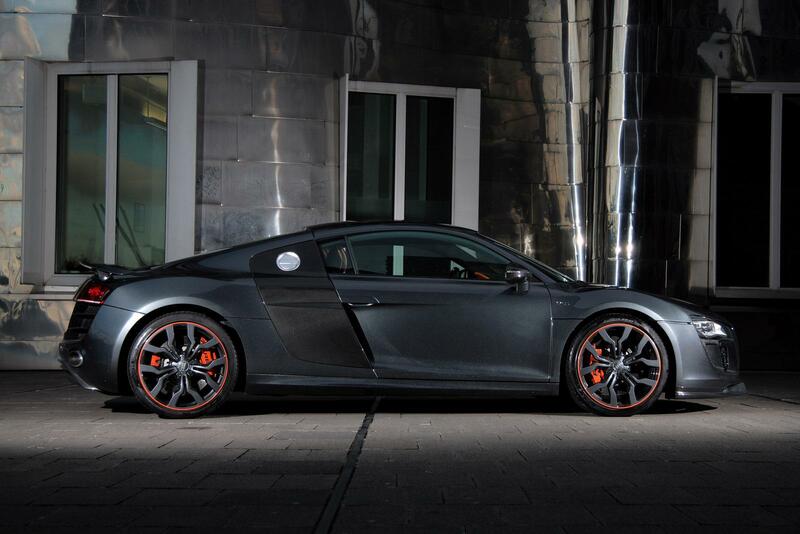 This is shown also in an impressionating way by the R8 performance kit. The upgrade contains also a valve commanded sports exhaust system, warranting for a weight lowering of 17 Kg (37 lb. ), with racing cats and sports air filter, as well as a new engine power management. Thereof result 585 HP (525 HP serial), and the final velocity additionally increases by about 12 kmph/7.5 mph in comparison with the serial values. The appearance of this impressionating car is dominated by its sportive-dynamic look - from outside, as well as in the interior. 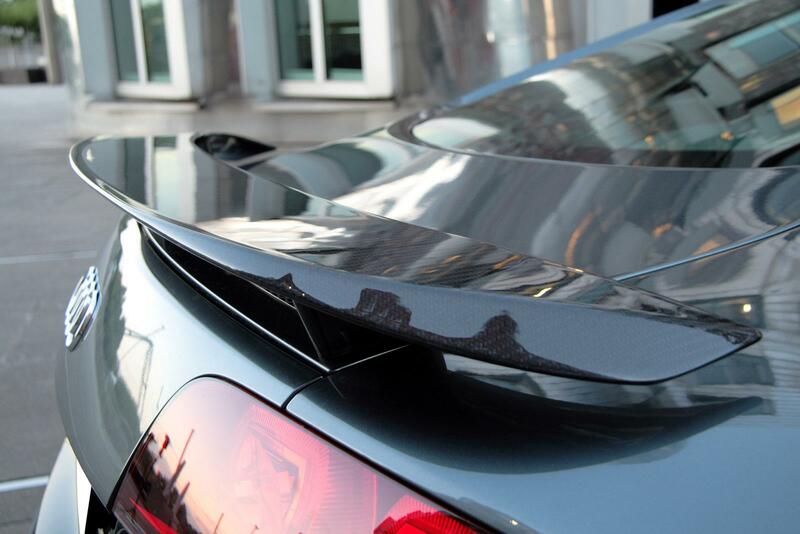 The ANDERSON GERMANY aerodynamic kit comprehends a brutal carbon front apron and rear spoiler for the downforce improvement, warranting for a persuading look and optimizing in the same time the aerodynamics of the vehicle by its agile design. Furthermore, the exterior racing packet is topped by a carbon diffusor, rear window bordering and carbon mirrors. The interior shows the gathered since many years experience of the ANDERSON GERMANY manufacturers. 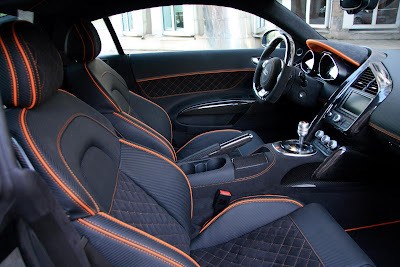 So, among others, the high class matt carbon-leather equipment with orange rhombus-shaped seams and the carbon interior packet (door trims, radio frame, ashtray, gear stick frame, hand brake knob, steering wheel) give a unique fine feeling.